I've been hesitant this summer to publish my classroom photo tour. Although I've probably spent more time in the classroom these past few weeks than any other summer, I still feel like it is not even close to done. I finally had to remind myself that a teacher's job is never done. The to-do list always gets longer, not shorter. At some point, you have to stop and reward yourself for what you have accomplished rather than constantly worrying about what you still need to do. So here is is. A photo tour of my 4th grade classroom. A work in progress. Books are organized by genre and series. 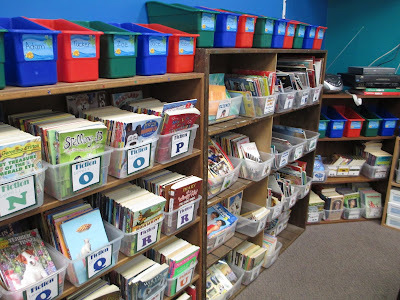 Fiction chapter books are organized by reading level. 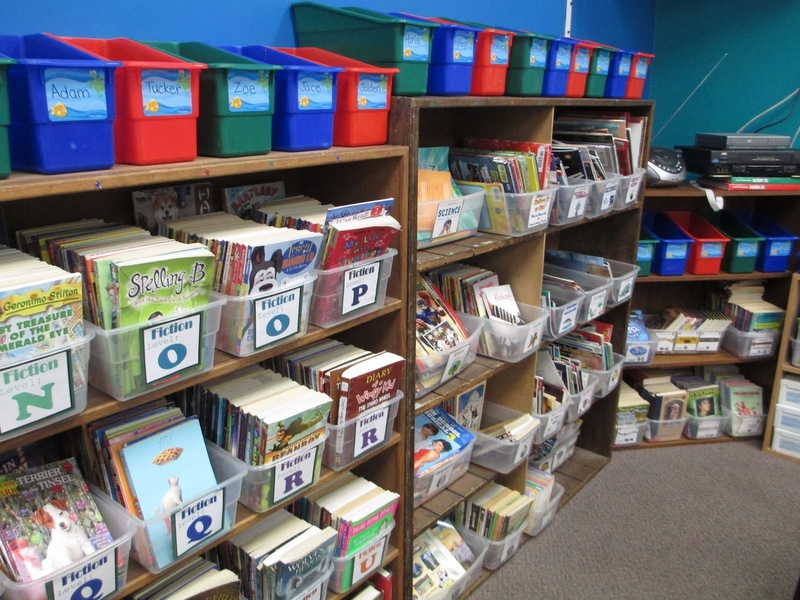 Students each have a book bin that will contain the books they are currently reading, their reading folder, notebook, and reading log. 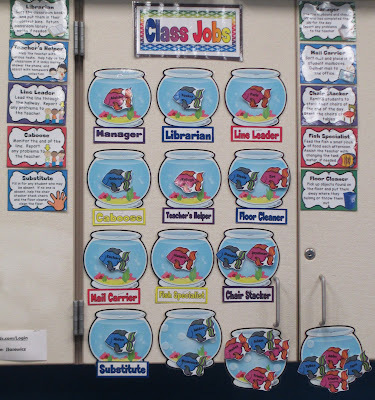 Our class jobs are posted for all to see. Every Monday I rotate the jobs. Student names appear on fish. Behind each fish is a piece of Velcro that easily sticks to the fish bowl. Descriptions of each job are posted to the left and right. 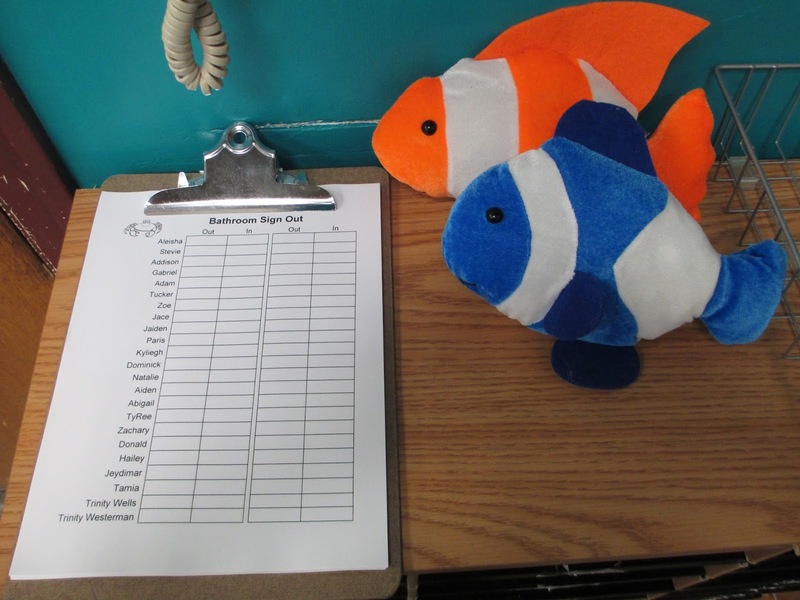 When students sign out to use the restroom they place a stuffed fish on their desk. Orange is for girls and blue is for boys. This helps me quickly account for all students. 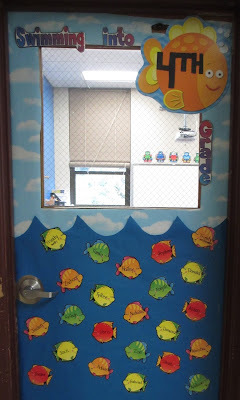 Our classroom door has a fish theme. 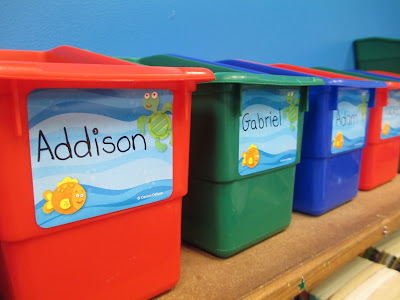 It says, "Swimming into 4th Grade," and student names are located on the fish. 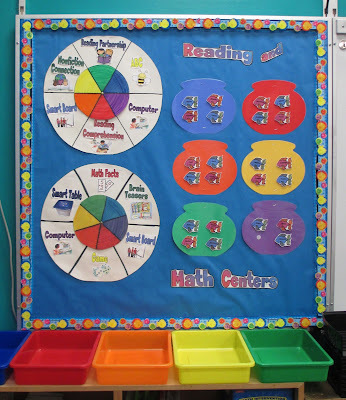 Our reading and math center rotation board is made up of 2 wheels. Each day I spin each wheel once to the right. 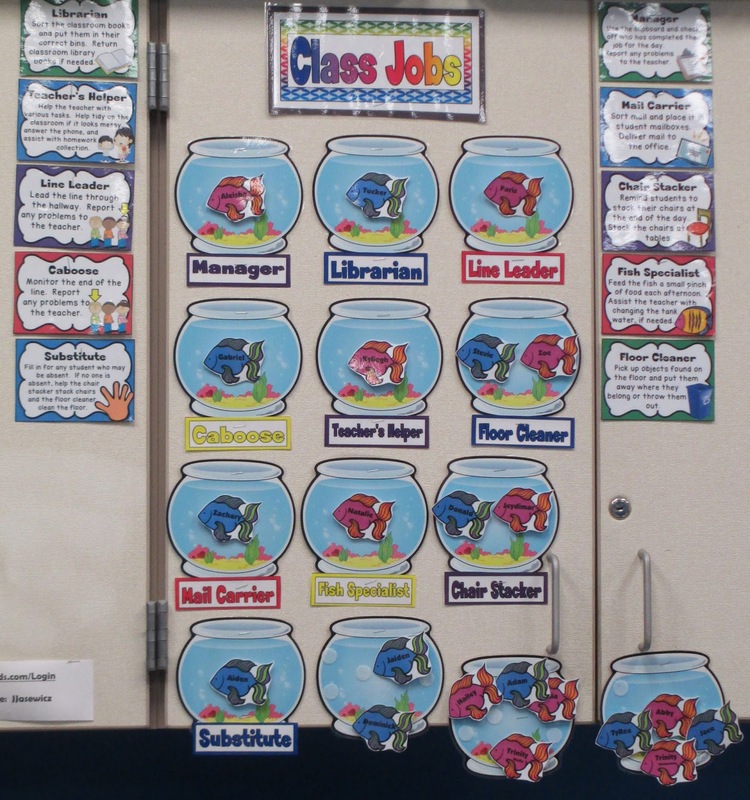 Students names are on fish, which are Velcroed on to colorful fish aquariums representing their group's color. If there is work to turn in they place it in the color bin that matches their group's color. Student desks are in groups of 4-5 students. 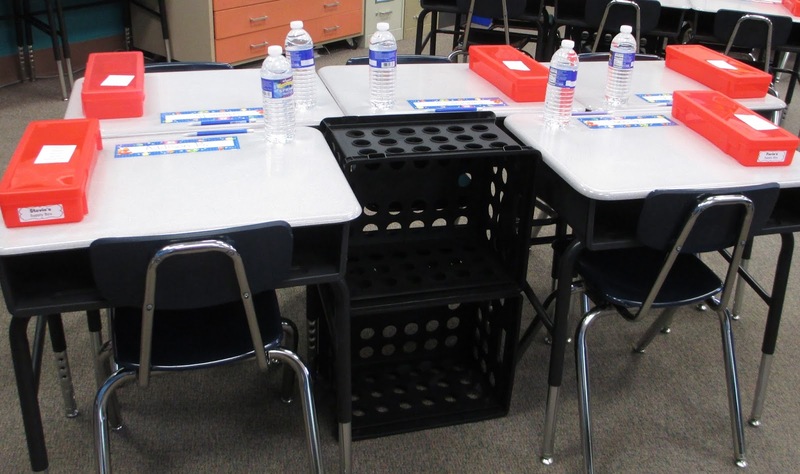 Black crates are placed at each group to hold their pencil boxes, folders, and other supplies. My teacher desk houses my computer, toolbox and drawers full of photocopies for the week. To the right of my desk is a mini-fridge, microwave, and more drawers for important documents and information. We have 4 additional computers that students use throughout the day. Our class meets on our world carpet in front of the Smart Board for whole group instruction. That's all for now. Like I said, it's still a work in progress but I wanted to post what the room looks like so far. Our first week of school was fantastic. My students are absolutely amazing and I can't wait to get to know each of them better and learn alongside them throughout the year. Fantastic! Welcoming, attractive, and organized! Well-done! Your work in progress looks pretty great to me! Super organized- a great place for kids to learn! Your room looks great! Colorful and inviting. Good luck on another wonderful year. Enjoy the journey.